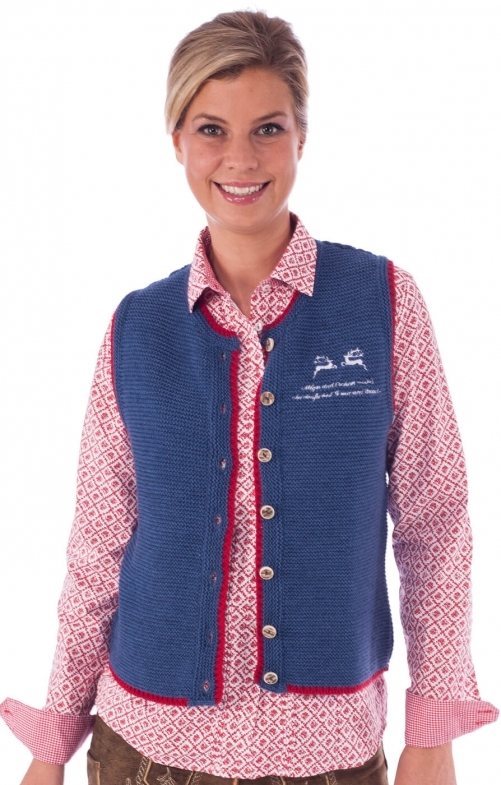 Trachten jacket for women, in dark blue. Intricate details and a high quality finish make this Orbis Trachten jacket particularly striking. With its turn-down lapels, closable flap pockets and wide back tab, this woman’s single-breasted jacket is designed to be a classic. The short, embroidered stand-up collar is adorned with a dark green contrast material reaching down to the button placket. Contrasting braids at the pockets and shoulders create lovely accents and lend the design an air of modernity. Decorative buttons and sophisticated seams emphasise the lightly tapered fit and are the icing on the cake of this design. The inside is covered with a silky lining, guaranteeing great comfort when worn and enhancing the sophisticated look. A particularly wonderful companion for all festive occasions.